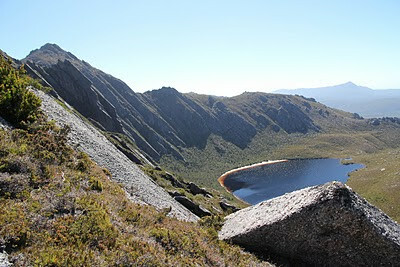 Returning for the fifth time to Lake Rhona in Tasmania’s south-west wilderness, reinforced the old Greek’s idea. Much has changed in the quarter century or so since I first visited this jewel of a place. But one of those changes actually meant we didn’t have to step in the river at all. The walk to Lake Rhona used to involve crossing the Florentine and Gordon Rivers via the Timbs Track, before a two day slog up the invariably boggy Vale of Rasselas. The spectacular crag-enclosed, sand-fringed lake could only then be attained via a final steep trudge up a long morrainal ridge. By the early 1980s the safe crossings, first a bridge, then a flying fox, had been swept away by floods. An alternative route via forestry roads through the Florentine Valley lead to a crossing of the Gordon that was somewhat less risky than the downstream crossing. Nonetheless in the 1980s I once crossed it in flood, with the waters chest deep. I’ll now plead youthful folly, as it’s not something I would care to repeat. By contrast last week’s crossing of the Gordon was a simple dry-boot affair. A wind storm has brought down a massive eucalypt, which now spans the river very close to where we once waded it. Fifth time lucky, if only for the first hour of the walk. Because once you join the old track up the Vale of Rasselas, you are transported back in time to the boggy slog of yesteryear. The odd name for this wild plain derives from Samuel Johnson’s 18th century book The History of Rasselas, Prince of Abissinia. It is a tale of a man’s search for the root of happiness. With liberal use of rose-coloured glasses, some colonial has dubbed this waterlogged plain a vale of happiness. In the 1820s this was the sort of dragon’s lair that kept the early settlers in the east of Van Dieman’s Land safely separated from the convict settlement of Sarah Island in the west. 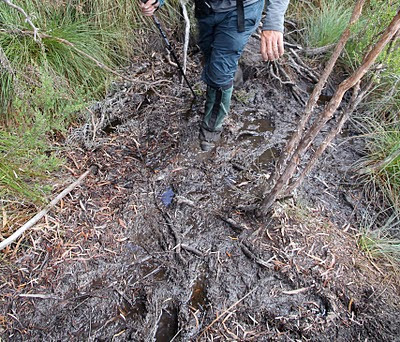 The mountainous wilderness and treacherous bogs were supposed to create that reassuring buffer. But in 1828 one pair of convicts, James Goodwin and Thomas Connolly, escaped from a pining party on the lower Gordon River. Goodwin's own account of their travels suggests that they crossed the Prince of Wales Range and entered the Vale of Rasselas near the Denison Range. They then went on via Wylds Craig to the settled areas of the east. If this is true, it is a feat of “bushwalking” that would thrill the most hardened of today’s peak baggers. We walked through a fraction of that same territory at the same time of year as the two convicts. We had tents, sleeping mats, sleeping bags, food, torches and all the modern equipment that walkers consider essential. They had only the clothes they stood up in. Goodwin was eventually pardoned, and went on to use his bush skills in assisting government surveyor John Darke to explore the very same area. The “happy valley” may have been just that for the Tasmanian Aboriginal people. A valley mixing buttongrass plains with patches of forest, unfailing water supplies and nearby mountains, would have provided plenty of food and shelter, if you knew what you were doing. Goodwin claimed he and Connolly saw many natives in the area during their escape. And John Darke recorded bark huts in the Vale of Rasselas in his 1833 survey. Later that century, railway became the favoured means for opening up country for exploration, mining and other uses. Extraordinarily, in 1898 the Great Western Railway Company proposed a route through the Vale of Rasselas and on to the west coast, using electric trains. A great deal of money was spent, but the proposal never went ahead, even if it did help establish the (now defunct) osmiridium mine at nearby Adamsfield. As we sweated our way up the Rasselas Track on a warm autumn day, I found it hard to conceive of electric trains clacking by. 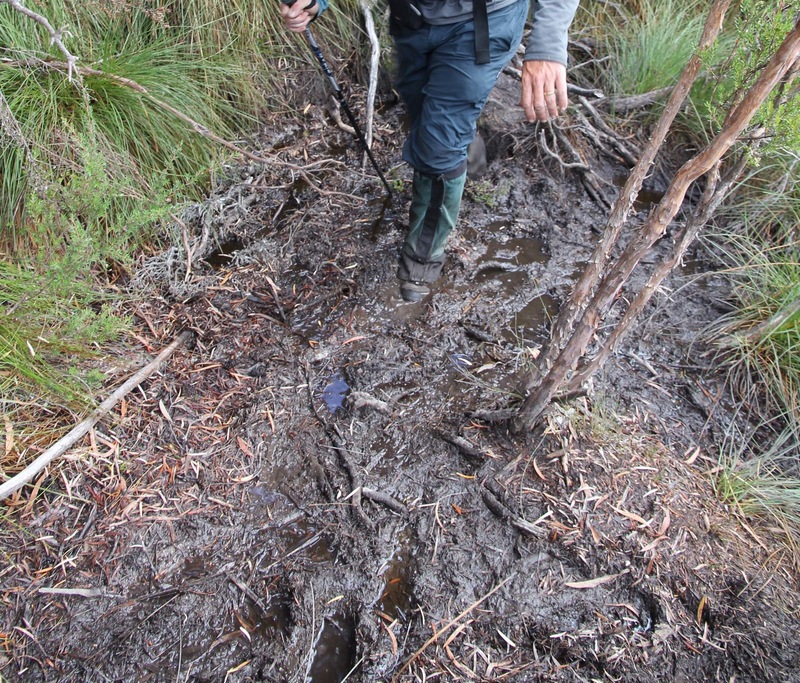 But then the Tasmanian wilderness has always attracted more than its share of strange ideas and colourful characters. And Wyld's Craig in the background! (Great picture). I remember such a heightened sense of anticipation, the first time I slogged up that spur and into Rhona's bowl in 1993. Such a compact and satisfying adventure is a roam onto this portion of the Denisons.